Daily Illuminator: Retailers – With This Kit, Your Gamers Can Play Munchkin Like A Pirate! August 2, 2017: Retailers – With This Kit, Your Gamers Can Play Munchkin Like A Pirate! Ahoy! Avast, ye scurvy dogs!
. . . Oh, hello. I was just practicing my pirate speak, since Talk Like A Pirate Day is less than two months away (September 19). To celebrate that venerable holiday, Steve Jackson Games is looking for retailers to host "Play Munchkin Like A Pirate" Game Days during the week of September 15-22! But if you need the games to sell, pick up the Play Munchkin Like A Pirate Bundle. 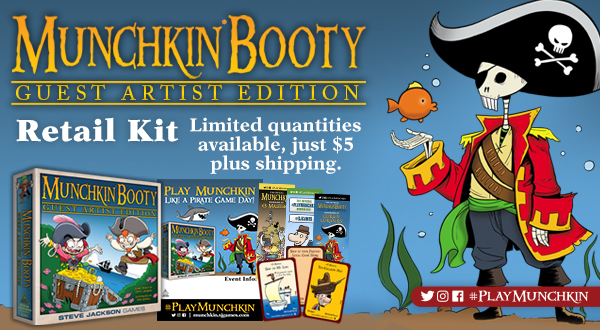 It has the same promo-packed kit, plus 5 copies of Munchkin Booty Guest Artist Edition and 3 copies of the Munchkin Booty: Fish & Ships booster. And remember, Warehouse 23 orders over $100 get free shipping, so if you get this bundle and one other small item, we'll ship it free. As the event week draws closer, we'll post a Daily Illuminator listing the names and locations of all the stores hosting a "Play Munchkin Like A Pirate" Game Day, and we'll promote the event on social media. We'll put social-media graphics, a printable flyer, and poster graphics in the Retailer Portal a few weeks before the game week, as well. And, of course, during the week of September 15-22, we'll run the usual #PlayMunchkin social-media contest. So climb aboard! We promise not to make anyone walk the plank.